Tony Brtko: I'm not giving you orders. I want to save you! Rosalie Lautmann: You drunkard! Don't come back on Monday! Although in recent years we seem to have been inundated by movies about the Holocaust, for many years it was a subject that the cinema shied away from. 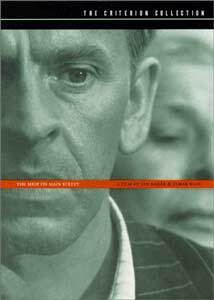 One of the groundbreaking films in the genre is the Czech picture The Shop on Main Street. The winner of the Oscar for Best Foreign Film of 1965, it is still a warmly amusing and tearjerkingly affective work. The picture is set in 1942 Slovakia, where the fascists were in firm control. Ne'er-do-well carpenter Tony Brtko (Josef Kroner) resents his brother-in-law Mark (Frantisek Zvarik), a leader of the fascists in the town. However, as part of the Aryanization of the village, Mark arranges for Tony to become the Aryan administrator of the local button shop, owned by elderly Rosalie Lautmann (Ida Kaminska). Unfortunately for him, Mrs. Lautmann is both hard of hearing and her sight is too poor to allow her to read, and he can't quite communicate the situation to her. Won over to her, Tony becomes her assistant instead of seizing the shop, although keeping up the pretense that he is in charge, which is not easy with his grasping and avaricious wife Evelyn (Hana Slivkova). Things take a turn for the worse, however, when the fascists begin rounding up the Jews for deportation, and Tony must find a way to hide or otherwise protect the completely oblivious Mrs. Lautmann. Shop nicely combines humor with tragedy. The scenes where Tony is trying to get the situation across to Rosalie are quite funny, and have a moving counterpoint in the concluding sequences as he tries to keep her from the door of the shop as the Jews are being rounded up and put on cattle trucks. Tony's character is obviously central, but he is not some saintly comic book character like Spielberg's Schindler. Even as he is trying to hide Mrs. Lautmann, his instincts for self-preservation come to the fore and in a terrifying sequence, he briefly tries to get Mrs. Lautmann to give herself up. This moral complexity and ambiguity lends Brtko a serious credibility. Resentful and put upon, he isn't necessarily a hero as such, but more of a real person. The true drama of films under a totalitarian regime must come from true human lives, and not cardboard constructs. This technique prevents us from distancing ourselves from the situation. Even as we identify with Tony, we understand his temptation to yield to the forces of evil. Like the stork nesting in the chimneys, he thinks he can hold himself aloof from the occurrences around him, but it's not possible when faced with the ultimate evil. Ida Kaminska is a gem as the slightly dotty Mrs. Lautmann, turning in a wonderful performance. The camerawork is attractive throughout, with a variety of distortions affecting the screen. The drunken Tony peers through a glass, and the camera sees the warped world that he views. Similarly, he sees a twisted reflection of himself in a shiny cigarette case given to him by Mark. This technique reaches its height in a pair of dream sequences, which feature gliding movement and dialogue without mouths moving. Although it takes a while to get going, the end result is quite worthwhile and a worthy addition to the Criterion Collection. It's hard to fail to be moved by this movie. Image Transfer Review: The original full-frame presentation is intact here. The film is in black & white, and the rendering from an interpositive provides a wide range of grays, deep blacks and good shadow detail. A few scenes are intentionally very soft and overlit; these come through quite well. I saw little in the way of compression artifacts. For the most part, the source material is excellent. However, the end of the last reel has a wide variety of scratches, spots, speckles and dirt. If not for that, this would be a solid B+. Bit rates are consistently high, aided by the RSDL presentation. Audio Transfer Review: The 1.0 mono (compressed at a fairly high bit rate for mono of 160 kbps) has a sizable amount of hiss and noise, particularly in the opening sequence. I don't understand Slovak, but the dialogue appears to come through cleanly and clearly. Music is a shade on the tinny side and lacking in bass and upper registers, but it's not terrible. The dissonance of the score nonetheless makes a piercing impact, supporting the picture with a Slavic feel that is nonetheless disturbing. Considering that Eastern Bloc films have notoriously bad sound, this is a perfectly acceptable sound transfer. Extras Review: This disk is rather short on extras. Aside from a rather dirty US trailer, the only content is a 1966 article by director Jan Kadar contained in the booklet. It briefly talks about the importance of Holocaust art focusing on the individual rather than the six million, since the six million killed is beyond human comprehension. Chaptering is very good, but the layer change is badly placed and rather jarring. A moving tragicomedy from Czechoslovakia, given a mostly very good transfer from Criterion. Lacking in extras, and lackluster original sound, but definitely worth viewing for anyone interested in a serious drama.